PNC closed out the week with an earnings driven 3% gain on very heavy trade. This powerful breakout drove the stock past its declining 200 day for the first time since June of last year. 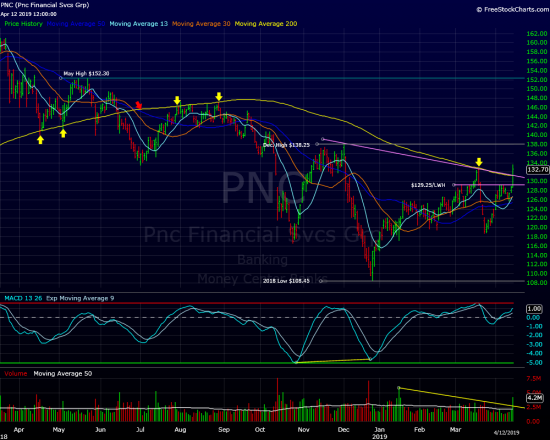 PNC had been struggling with the 200 day since late July. It marked the July peak as well as multi week highs in August. At last month’s high the 200 day rejected the post Christmas rally as well. The stock could make a nice run with this key level cleared. Initial support is near the $129.00(last week’s high). A close back below this week’s low($125.80) would indicate the 200 day is still a force. At time of publication we do not have a position in PNC.